Holy X-Files! What Are These Rings In My Lawn? After years of searching for life on other planets, your lawn finally has the proof we've been looking for! Those rings that are 3 inches to 3 feet in length are crop circles put in your lawn by an advanced, but miniature, alien civilization! Okay, get a hold of yourself Mulder. Sufficient to say that there is a logical explanation for these circles in your lawn, and unless treated, they can actually pose a serious threat to the health of your lawn. In today's article, we'll take a look at Necrotic Ring Spot. 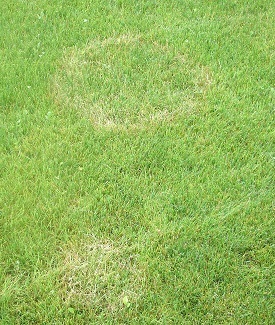 Necrotic Ring Spot is a fungus that appears in your lawn as ring shaped areas of dead, or dying, grass. Within the circles you may even see yellow to light-green colored turf blades causing what is often described as a "frog eye" effect. Necrotic Ring Spot can appear in your lawn in a variety of sizes, most often between 3 - 36 inches in diameter. If not treated, these spots can grow in size and number, causing death to the infected turf blades. Necrotic Ring Spot really begins to thrive and appear when temperatures surpass 80 degrees and soil conditions are dry. However, a build-up of organic material in your soil, such as remnants from wooded areas, and moist conditions can trigger the initial growth. Additionally, compacted areas of soil can promote stress within your turf, creating favorable conditions for it to grow and thrive. Fungicide: applying a fungicide to Necrotic Ring Spot will help suppress the disease and keep it from spreading. Aeration: an aeration pulls thousands of tiny plugs out of your lawn, creating pockets of air within your soil that relieves stress and helps water and fertilizer to reach the root system. This alleviation of compaction in your soil can help prevent this and many other lawn problems that prey on stressed lawns. Necrotic Ring Spot and other lawn disease is no laughing matter. Hiring the wrong person to treat it can make the condition of your lawn even worse. 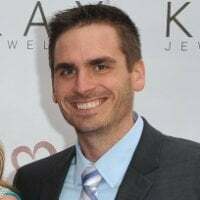 That's why we've put together the ultimate Lawn Care Company Hiring Guide that can help you hire the right company for the job. This guide will walk you through everything you should be looking for when it comes to hiring a lawn care company. The best part is that this guide is yours absolutely free by clicking on the link below.